Are you still considering where to watch this coming FIFA World Cup Match?? 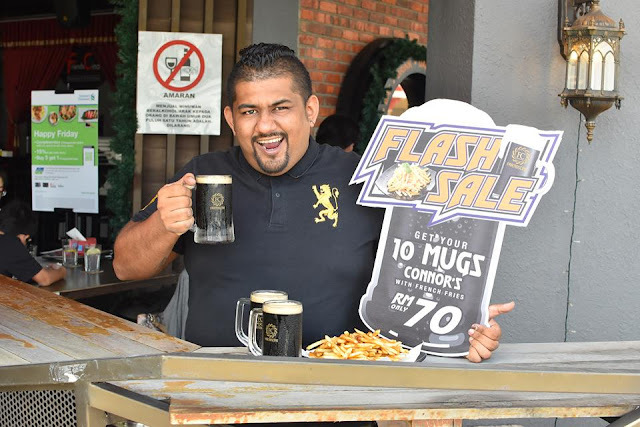 Eddy Rush Fatboy and The crew found the cheapest Connor's Stout deal in town, I'm serious that this is the best deal during this FIFA World Cup period. ARABIC BBQ CHICKEN WITH RICE 14.50 我绝对喜欢这道菜, 烧烤鸡肉和阿拉伯大米好好吃. 鸡肉的大小令人满意和蒜酱是一个惊. 还有特殊的咖喱粉使它很好吃. SEAFOOD TOM YAM WITH RICE 16.90 东炎里有满满新鲜的鱿鱼, 虾, 蛤蜊和其它各种海鲜, 东炎汤也不缺乏味道, 因为它够辛辣和浓郁. ARABIC LAMB MANDY WITH RICE 19.90 而旁边的另外的酱汁给了它那令人兴奋的味道,大米也联合了一种芳香，组合在一起也太棒了. 这道菜强烈推荐给所有爱吃羊肉的人. ALANNA’S SPECIAL GRILLED CHICKEN WITH RICE 15.90 这就有点不同会令你味道绝对特别， 简单而美味的烤鸡肉饭真正的不一样. 这道菜上的小炭烧烤至完美, 从腌料, 米饭和酱汁中汲取了丰富的味道.